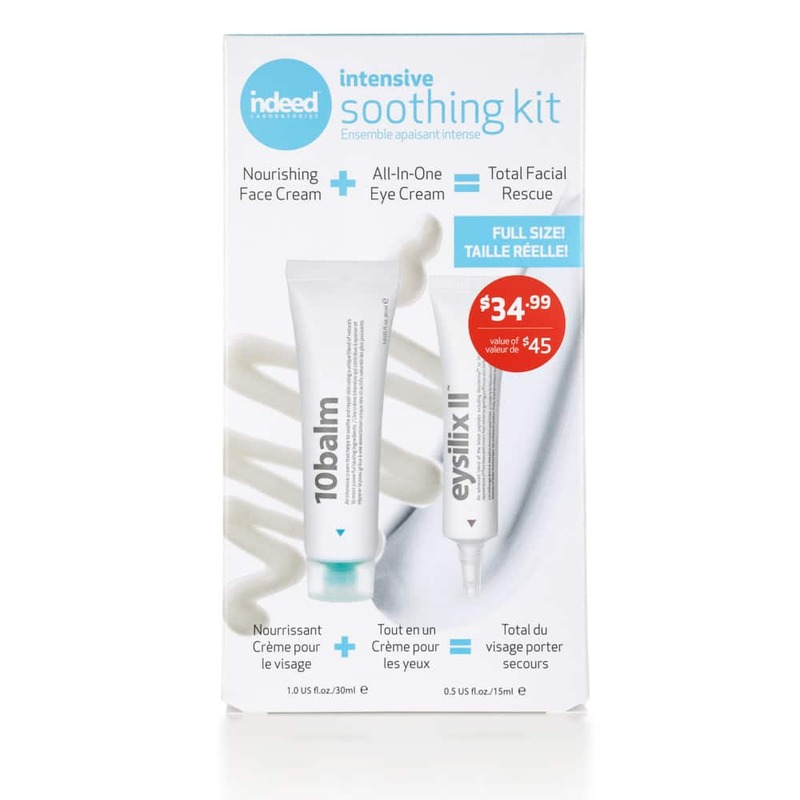 This intensive soothing kit includes 10balm™, a nourishing face cream and eysilix II™, an all-in-one eye cream for a total facial rescue. 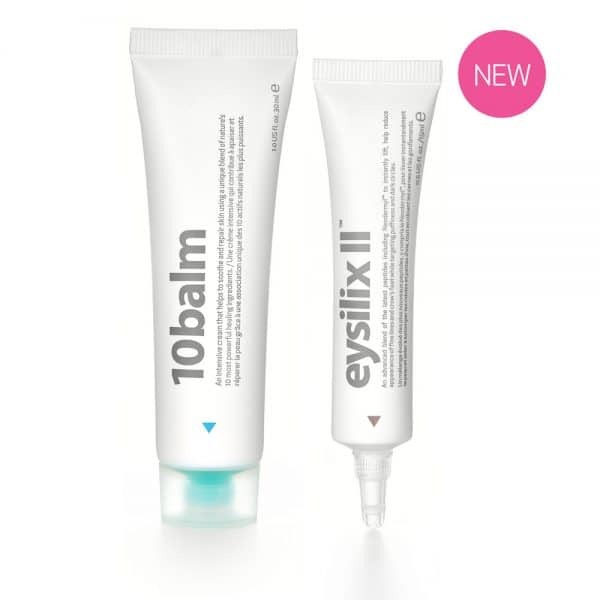 10balm™ brings comfort to irritated, distressed and sensitive skin while providing essential nourishment, comfort and hydration. Packed with a high concentration of 10 of nature’s most powerful healing ingredients, 10balm tackles a common skin concern – sensitivity. Eysilix II™ is an advanced total eye cream formulated with Neodermyl™ that helps to smooth fine lines and wrinkles while reducing the appearance of dark circles and puffiness. This multi-functional eye cream with powerful peptides, ceramides, extracts and probiotics provides both preventative and restorative results to all your daily eye concerns. 10balm and Eysilix II™ are paraben, colourant and fragrance free. After cleansing, apply eysilix II™ by gently patting a small amount around the contour of the eye. For best results use in the AM and in the PM. Follow with 10balm™. Apply 10balm™ liberally to the face or to the affected skin area. Use as often as needed. 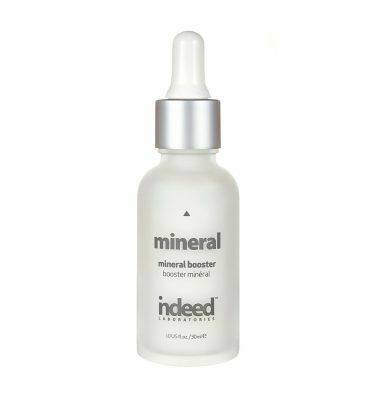 NEODERMYL: A pure source of bio-energy that can naturally diffuse into the skin to re-energize cells and trigger essential elements that produce collagen and elastin. This “needle-free” collagen and elastin filler reduces the visibility of deep wrinkles and improves skin firmness. DERMAXYL®: An active that repairs the skin’s natural barrier function by stimulating cell communication to smooth wrinkles and age related damage. UPLEVITY™ PEPTIDE SOLUTION: A tetra peptide that counteracts sagging and aging effects around the eye by increasing collagen production and functional elastin, allowing skin to resume its shape after being stretched or contracted. As a result, the layer beneath the skin (dermis) is significantly firmer and more structured to better resist effects of aging. REVITAL-EYES: An invigorating complex rich in probiotics, green tea extract, pomegranate extract and caffeine. 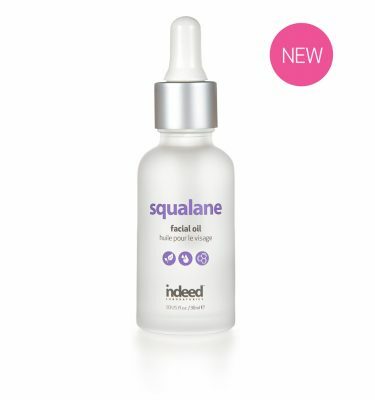 This active helps protect the eye area from environmental damage while diminishing the appearance of dark circles and puffiness.